“Mobile phone is no longer a mere accessory, but an office in our pocket” were the words in reply to a question on how mobile technology has changed our lives. “But what about IT (Software), what is its future?” asked one of the tech guy. “IT alone cannot help shape the world, it should and will bond with biotechnology and nanotechnology to form an unified form of technology that will create wonders that we have not even begun to imagine” came the reply. The manager began to scribble down furiously, he knew this was good stuff. The five assembled in the room other than myself were notably impressed, but this was to be expected, for what else will you expect when in a private meeting with a world famous Indian. But they weren’t gonna give up and neither was I. The two women opposite to the manager were engaged in a furious discussion. Soon one of them spoke up “What do you think is the future of our rich forms of dance and music, is it destined to vanish because of these modern, devices addiction of our young?”. Came the reply straight at her “Our culture is neither in the stage to accelerate (recklessly) or simply vanish in the future, it will remain stable as it always has been, for India has the ability to seal the holes of greats with the young and energetic”. There was a palpable acceptance of these precise words. Soon after this, the wiseman turned to me and for the first time in my life I was face to face with a person I thought I would never get a chance to meet in person, let alone talk to. He asked “So what school do you go to?”. “PSBB – Padma Seshadri School, sir” was all the words I managed to get my vocal cords to produce. “Oh, so what do you think is the feature in your school that is important to you”?. I had to take several deep breaths, replay the words in my mind & contemplate – where do I even start, the teachers, the students, the books, there was so much to choose from. Then it hit me, our Dean! I had never ceased to be amazed by the sheer will and spirit of our Dean. She was also a silent mentor to me. “Our dean, sir”. Instantly he fired at me “And why her?”. “Her ability to conceive an idea that can satisfy and even excite students like us, at that grand age of 90 is simply phenomenal. I mean, when I get a slight twisted ankle or something like that, I just slob on the bed, turn on the TV and just slack up. While she can’t even walk, is able to do so much for all of us and even attend several functions and programs. That just blows my mind” I answered. “Good, one thing I’ve noticed about your school teachers is that their single minded purpose is to teach and help you grow. This is very rare and your school has got it. Now when I was a mere student in Rameswaram, I had a science teacher whose name was Siva Subramanian. He not only radiated of knowledge which was no surprise for he was a scholar of Sanskrit, expert in Maths & Science, and of purity. What more can you ask of a teacher?” came the informed reply. The old woman seated near the wiseman, who was the very reason that this trip was conceived, said “What is your vision of how robots will change the world?”. The visionary in him replied “I have read a science fiction story on this and I‘ll tell it to you. There was a scientist, Anees who creates several robots with AI (Artificial intelligence). One day the robots gather and have a meeting. They want to have freedom so they plot to capture Anees. A wise robot in the meeting voices against it saying Anees is our creator and who wants to capture the creator?. Anees accidently hears this conversation and then starts to give the robots some freedom. From this they produce original ideas and works. Your answer can be derived from this”. We all felt like having made a trip to future and back. After this, still in awe and boatload of stuff to think, we opted for a photo-op. After few minutes of poses for the camera, it was time to take leave. As I turned to leave, he called me and asked “Who is your best friend in class?”, I answered “My friend Pranav”, came a follow up query “What is he good at and what do you do as friends?” for which I said “His interest are in weaponry & tactics, while I’m a animal enthusiast and tech lover. Whenever we see anything in the paper that interests us, we talk about it, how it can be changed and improved“. I asked if I can ask a last question and he said “why not”. My question was “Where is Indian Technology heading to?’’. “Indian tech is at a crossroad, either it chooses to walk in the way of money or the way of benefit to society. Many are going the former way, but I know that India will not do so, we have a rich history of scientists whose discoveries and inventions were for the people and that tradition will never end’’. I bid farewell to the great man and rode home with the others in the room. But who were the others and where had we been and who was the man who answered our endless amount of questions with such ease and knowledge? The place, Cauvery Suite, Raj Bhavan, Chennai. The old women, my maternal grandmother whose lifelong dream was to meet this great man, a wish that came true due to efforts of my father, who had met this man twice before and was the tech guy. The two women are my aunts and my Mom was a silent observer through all this and I, well you know me. And the wiseman was our former President, world renowned Aerospace engineer and thinker, Dr.A.P.J. 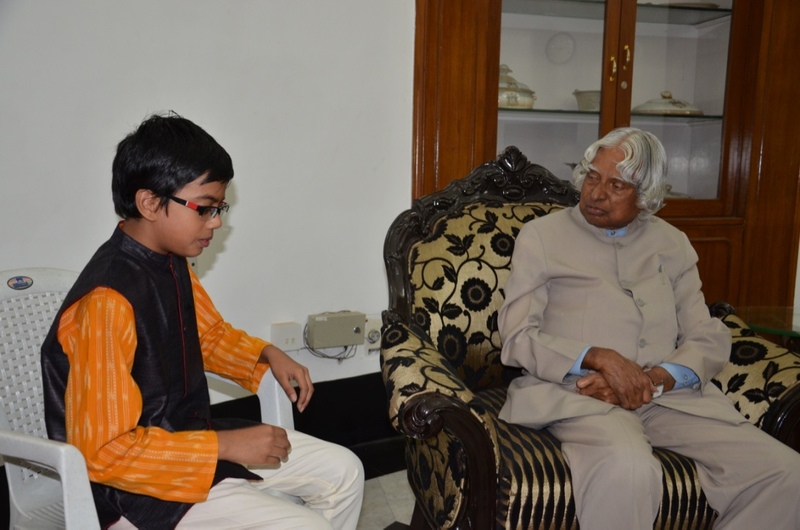 Abdul Kalam, the Man with The Dream.